A Volusia County Sheriff’s Office K-9 was fatally shot Tuesday evening while chasing down an armed suspect who had fled and fired at deputies in Deltona. K-9 Forrest was rushed to DeLand Animal Hospital following the shooting. He passed away shortly after arrival. According to a press release, Forrest was shot at about 7:16 p.m. near Vann Park after the suspect opened fire on deputies who were searching for him in a wooded area. Deputies responded to Wing Terrance after receiving a Crime Stoppers tip about a wanted fugitive. While they were at the location, a man rode by on a dirt bike in a reckless manner. According to reports, when a deputy tried to stop him, the suspect fled. Deputies did not pursue the suspect at that time. A short time later, the man brazenly drove by recklessly again. The dirt bike was later found abandoned nearby. When deputies made contact with the individuals inside the house where the fugitive was believed to be staying, deputies heard someone jumping over fences. Deputies set up a perimeter, and the Sheriff’s Office Air One helicopter spotted the suspect in a nearby wooded area. 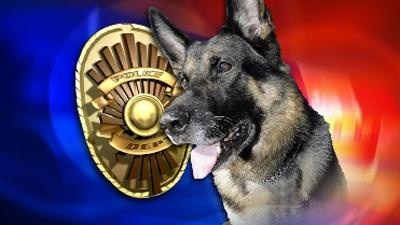 K-9 Forrest had started tracking the suspect when he opened fire and shot the dog. As of 10:54 p.m., the suspect was still surrounded by law enforcement in the area of Vann Park. Additional updates will be provided as they become available.